Fighting fire in commercial and industrial locations can be challenging and become more costly than it needs to be. Is your department fully ready? Properly equipped and trained fire service agencies can help limit damage from a fire or other emergency. FM Global is committed to assisting fire service agencies worldwide. FM Global provides free resources for the fire service to help them better understand facilities where they are called to respond. The FM Global Fire Prevention Grant Program and the Fire Service Training Grant Program offer funding and training for various needs within the fire service community. The training will help your fire service teams to better handle industrial fires in large commercial and industrial buildings. FM Global has a worldwide reputation for its fire loss prevention expertise, and as one of the world’s leading insurers of business properties, our scientists and engineers have collected decades of fire protection data. Combine your expertise with ours to help you be better prepared to protect facilities within your jurisdiction. Come witness first-hand how and why we burn things down, blow them up and recreate nearly every natural disaster that Mother Nature can muster. At the world's largest epicenter of loss prevention engineering research, we help our worldwide clients develop solutions to protect their facilities from property risk. Automatic sprinklers are an important line of defense when fighting a fire. Yet, even with sprinklers, fires can still burn out of control, causing excessive damage. The purpose of the Fighting Fire in Sprinklered Buildings is to provide firefighters with a greater understanding of why these losses occur and how to help prevent them. The program will provide participants with an understanding how automatic sprinklers work and how to develop a sound pre-incident plan that will improve the effectiveness of firefighters operating at protected properties. Automatic sprinklers are an important line of defense when fighting a fire. 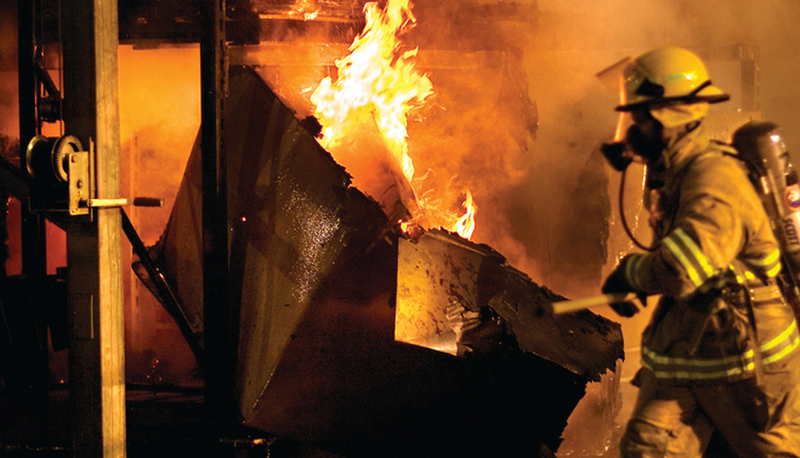 The purpose of the Fighting Fire in Sprinklered Buildings is to provide firefighters with a greater understanding of why these losses occur and how to help prevent them. The FM Global Fire Service Training Grant provides selected fire departments with realistic, hands-on training for fighting fire in commercial and industrial facilities. This training is conducted by training specialists at FM Global’s Emergency Response Consultants training campus in Rome, Georgia, USA. While there, participants will have the opportunity to learn from loss prevention experts, using state-of-the-art equipment, so that they can apply the knowledge afterwards within their jurisdictions. All costs for the training (including travel, meals, etc.) will be fully covered by FM Global. For more information contact Michael Spaziani, manager, fire service programs, michael.spaziani@fmglobal.com. The FM Global Fire Service Training Grant provides realistic, hands-on training for fighting fire in commercial and industrial facilities. Being a firefighter is a physically demanding job. You are usually first on the scene of a fire, expected to contain hazardous materials on demand and must always be ready to provide emergency medical treatment. The only way you can perform these duties – and more – is to be prepared with the stamina and knowledge to do your job and do it well. FM Global, established in 1835, can share its years of experience in property protection to help you be proactive in your role as a firefighter. FM Global offers a variety of free training and resources for the fire service. Putting Our Money To Work to Reduce Fire Risk, www.fmglobal.com/grants. Make your community—and the world—more resilient, www.fmglobaldatasheets.com. When you need the right materials to address exposures and protect facilities within your jurisdiction, only FM Approved products will do, www.approvalguide.com. FM Global Emergency Response Consultants offers hands-on emergency response training to all levels of fire brigades, hazardous material emergency responders, technical and confined-space rescue teams, emergency medical services and local fire departments.